Kids are experts at falling down. Whether playing their favorite sport or just walking across the room, kids regularly reacquaint themselves with the wonders of gravity. However, with the right training, even the goofiest kids can improve their balance and coordination, which can help them in sports and daily activities. Here are four fun exercises that can help your child improve his balance and learn to better master his body. Standing on one foot is a basic balancing skill, but not every kid will be able to master it immediately. If your child is having trouble with this, start by having him first stand one foot while keeping the other on a stool. As he improves, replace the stool with a ball. Be sure to do this with both legs. Make a game out of it. See how long he can balance on each leg, and then have him try it with his eyes closed. 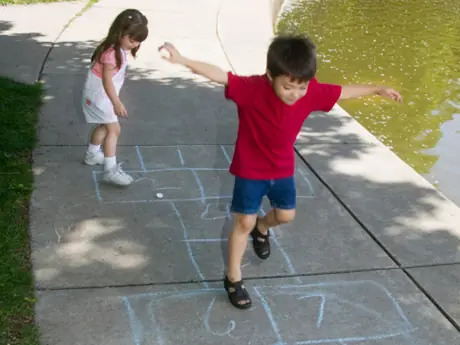 Hopscotch is a classic activity, and for good reason. It's great for developing balance and kids love it. For an extra challenge and to get even more out of this game, play it without switching feet. This takes the skills of standing on one foot to the next level. Bosu balls are popular in adult fitness, and are great for kids too. Have your child practice standing on top of the bosu ball for as long as he can. Once he's mastered that, turn the bosu ball upside down and have him stand on the flat part of the ball. It won't be easy. Increase the difficulty by playing catch with her while she balances. Balance boards can be difficult for anyone—young or old—to stay on for long. You and your child can take turns trying to stay on the board for as long as you can. Soon you may find your child can stay on way longer than you can. The key to improving your child's balance, or any other aspect of his fitness, is to keep the exercises fun. The more he's enjoying himself, the more he'll want to do. Jason Sheridan, owner of Sheridan Fencing Academy in New York City, coaches the 2013 Junior World Championship silver medalist, along with many of the other top fencers in the US. He specializes in developing high-level youth athletes by emphasizing the fun—and eliminating the monotony—in exercise and training.